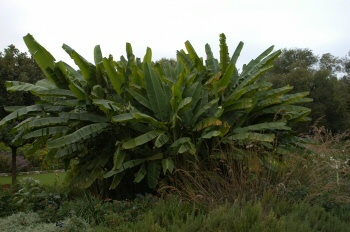 Growth Habits: Very large leaves, thick stems, spread by suckers to form large clumps. Banana clusters will set and produce in the southern one-third of the state. Culture: Nothing special if planted in healthy, well-drained soils. Use a basic organic program. Don’t let the roots stay too wet in the winter or they will rot. Bananas need approximately 15 months above 28° to bear fruit. Troubles and Solutions: Freeze damage and no fruit production in the northern half of the state. Harvest and Storage: Harvest the fruit whenever and if ever ready. To store the plant for the winter in the northern part of the state, cut the top off and throw into the compost pile after the first light freeze. Cover the stumps with a thick layer of mulch to protect the roots from winter temperatures. Notes: Bananas can be brought into production in greenhouses. If you have chickens, feed them the discarded banana leaves. 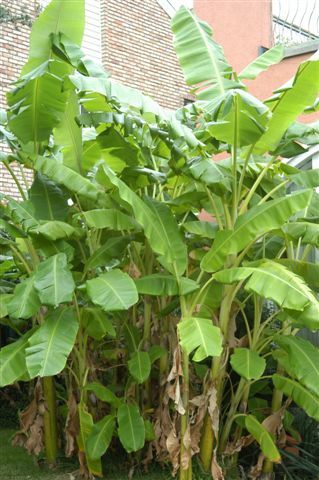 After the first frost, bananas, elephant ears, hoja santa and other large leaf perennials should be cut off leaving 2-3" stump. Then cover the stump with shredded much. Unless the roots stay too wet during the winter from frequent rains or poor drainage, the plants be back next spring to once again put on a show. Some gardeners put a piece of old carpet over the stump and the mulch on top of that if they concerned about the moisture rooting the crown of the plants. This information is for most of Texas and will not be the case in colder climates.